I ran to a couple of junkyards today with a few things on my wish list. I still had no luck on the L-series intake manifold, but I did manage to pick up some door bits. The locks on my doors lacked caps, which was more than just a matter of appearance. 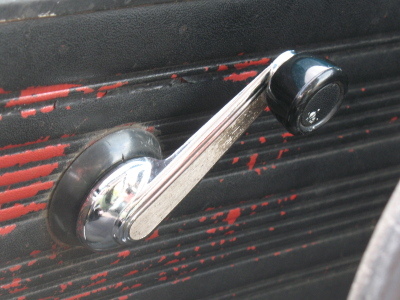 Without the caps, the rod that actuated the lock would actually sink below the deck of the door; you'd need needle-nose pliers to pull the rod back out. I found a pair of lock caps on a Datsun B210. 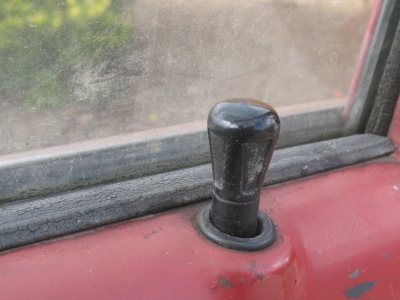 I also picked up another window crank lever from that car; the old one on my driver-side door was missing the knob. This one works. My 510 is currently missing a hand brake, so I pulled this one off the same Datsun B210. I'm not sure if the cable is the proper length, but at least the front assembly looks good and works properly. 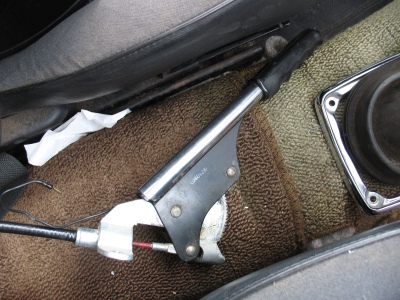 I'll update when I get the hand brake installed.